The big day was over, our promise to each other has been made and sealed by the divine power above, and now... IT’S TIME FOR SOME FUN! We wanted to escape to an exotic honeymoon spot, full of culture and romance! With a tropical atmosphere, lush jungles and an enriching experience, a honeymoon in Cozumel was looking to be a treasure. The honeymoon was the beginning of our journey in marriage. The very words rings with promise of romance, and oh how right they were! On October 23, 2009, we started out on our first expedition as husband and wife. It was made that much easier by Traveler’s Joy honeymoon registry, where our guests had given gifts to cover our $2200 first dream vacation, together as one. This was a haven for nature lovers, romantics and cultural fanatics all the same! We heard Cozumel to be a cultural experience, as well as a beautiful diamond dropped in the ocean. Sparkling turquoise water, reefs, and natural virgin beaches; we were SOLD! The weather couldn’t have been more perfect, 80-90 degrees during this time of year. Cozumel was so seductive due to the location and being able to travel to other parts of Mexico for even more experiences, without much of an effort. Ehren, my husband, is a cultural and history buff and is in his PhD program for Latin American history and ancient cultures; this was his place to be. Cozumel was considered by ancient Mayans to be the home of Ixchel, the goddess of love and fertility, and we wanted to experience the rich history and natural wonders, and take advantage of all the luxuries of a vacation. 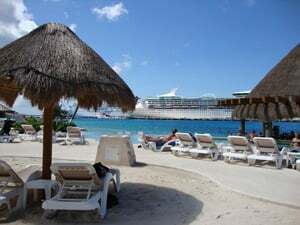 With its white sand beaches, sparkling azure waters, and clear, sunny skies, we couldn’t go wrong with Cozumel, Mexico. The honeymoon always seemed like an extraordinary thought. Any custom that involved traveling to an exotic place, being romantic and celebrating love was brilliant. Yet, the importance of the honeymoon didn’t hit me until I was riding in the car on the way to the airport. With the wedding on 08/29/09, I have never had to host a large event, exert so much energy and enter a new commitment within the matter of one day! We were both in dire need of rest and quality time with each other. Right after our wedding we had went to the Pocono Mountains for a three day get-away just to free our minds from what we went through, but this was our real honeymoon, and we were so excited. Whether getting away nearby home or flying across the world, these days are invaluable. We chose a virgin-beach paradise to relax our overextended bodies and minds. We spent a great deal of time researching our destination resort and resolved that we could create a perfect honeymoon with the right attitude. We tried to stay away from having too many expectations of our honeymoon resort, which is difficult when you have certain standards that need to be met. While we were planning our honeymoon, we determined that no matter what happened nothing could destroy our happiness. We brought an indestructible spirit with us. Our resort we chose was Park Royal Cozumel, a wonderful All Inclusive resort on the romantic Caribbean Island of Cozumel. It is surrounded by one of the main barrier reefs in the world. We were able explore an incredible underwater world in their famous crystal clear waters where we did snorkeling and just splashing around for fun. The resort had beautiful beaches we could walk onto and a spectacular reef that created a small barrier for the waves to splash against and break, as we could wade in the calm waters. From secluded privacy to mingling with the other resort guests, days and nights in Cozumel offered us the perfect balance between relaxation and excitement for my husband and I. With all our meals and drinks included, all we had to do is take it easy and enjoy the beauty of Cozumel, its clear blue waters and the first-class service at the Park Royal Cozumel! What we both found astounding was Park Royal recreated in its decoration and design, the best of two worlds: the Mayan and the modern. A number of original sculptures and art work could be found throughout the property, making the place special and unique. The hotel had been built with extreme respect for the natural environment with its all original palm trees and plants; this is why the hotel main pool is surrounded by beautiful greenery. We even found peacocks on the grounds, which was an exciting find. I was wondering what those weird footprints were in the sand on the beach! The amenities were amazing and the people could not have been more accommodating. We were arm-in-arm at one of the five swim up bars overlooking the ocean, and during our stay saw one of the most spectacular sunsets we have ever seen! The sun was as red as an apple, colors gathering in hollows, shadows slowly lengthening. The night sky which was tinged with purple and speckled red beautifully showed how the sun was setting below the horizon of the ocean. The sky was stunning shades of purple, pink orange and red, a few really dark spots of clouds layered over the sun as if they wisped by just for us. A bit of yellow and orange reflected upon the calm waters of the night. The setting sun set the sky ablaze with a combination of fiery cinnamon red and flaming orange, magnified by the still cool ocean. We had met a great couple while enjoying the sunset; the wife was from Portugal and the husband from Maine. We made life-long friends in one evening, just before the sun had made its mark in the sky. The restaurants were the best we have ever been to. Five star service! El Italiano was the perfect place to celebrate this special event. The gorgeous ambiance only accented the excellent gastronomy and friendly attention. This was a place were you could put on your finest and enjoy a romantic filled night starring into the eyes of your one and only. El Mexicano was another restaurant where they had a variety of dishes exquisite prepared. A truly flavor fest for all the palates! Mexican cuisine is known for its varied flavors, colorful decoration, and variety of spices and ingredients, many of which are native to the country. This is exactly what we found here and what kept us coming back multiple times! We melted into our surroundings and felt so appreciative for everyone that helped make our stay special. While never had to wait extended island-time for our drinks, we enjoyed our conversations and met friends we will have for a lifetime. We tipped them a little extra for allowing us to share their island home with us. Every moment was a chance to enjoy ourselves and we found many ways to do that. It must have been off season, so we literally had the island to ourselves, enjoying the secluded beaches, empty pools and our pick of where we wanted to go and eat at all times. Even when heavy rain clouds rolled in, we took time to hide out in our room until they passed. The warm, turquoise water surrounded us each day as we relaxed away our stress and dreamed of our future together. The smell of the ocean as we took rides around the island is one I can never explain. The jungle in the middle of the island provided a sweet smell, as the ocean breeze mixed with the lush greenery. We spent 15 months preparing for our wedding and now were able to concentrate on our personal goals. We discussed our aspirations, our missions in life and how we could support each other to achieve these objectives. We refocused on what was important to us and made a list of goals to keep as a reminder of our determinations. This was our time to create the pathway to a happy marriage through dialogue and support; that pathway has been paved! Horseback Riding Being in a beautiful place, spending time together, we wanted to make our activities as memorable as everything else had been. Next on our list was to find horse stables! Riding is an activity that stimulates the body, mind and spirit. Horses offer not only recreation, but the opportunity to learn the subtleties of the development of trust and boundaries; this is the very foundation of what draws me to horses and their strength of spirit. By its very nature, horse riding influences the whole person and the effect on all the body's systems can be profound. The unique combination of the horse and its movement with the rider produces an extraordinary effort on all the systems of the body, which is why I am addicted to and cannot go anywhere on vacation without experiencing it again and again. This activity was top on the list for us both! I love this quote about horses; it shows their true nature and what we can achieve when we come together as rider and animal. This was one of the main reasons we picked the resort we were at; horseback riding was within three miles! We headed to a ranch to do a three-hour jungle horseback riding expedition. It was mid afternoon when we arrived at the stables. The sun was beating down on us and the skies were as clear as they could get. I saw the beautiful creatures standing side by side. The sun radiated down on us, but I knew the horses would give us a ride that would cool our bodies. As we mounted the horses, I hear a familiar song inside my mind, tranquility filled my being. He was the color of nutmeg; his mane fluttered in the gentle cool jungle breeze. As I rose onto the worn leather saddle, he became as alert as a flame, every fiber tightening as his strong muscles rippled. My husband had a glimmer in his eye and the smirk on his face, knowing how much I love horses; he knew we were going to have a magical trip. Off the crowded and beaten path, we rode through the lush jungle, I felt rapid and smooth movements as his hooves pounded the ground, swift as rolling thunder and for those few moments of gliding through the air, we were one; poetry in motion. We rode through the jungle, seeing beautiful butterflies cross our path, stepping over trees that have fallen, and enjoying the pure smell of nature. This complex and rich ecosystem was vibrant with colors and a fragrance that you can’t experience anywhere else. About halfway through the tour, we came to stop and dismounted our horses and put them in the shade while we followed the guide into a clearing. As soon as we stepped out of the forested area, I realized that we were standing near a large fire pit. But what was it for? The tour guide explained to use we were at a Shaman’s home, a medicine man who does powerful ceremonies to help heal others and to help those willing, to find their spiritual path. We were invited in to see their sacred temple, their sweat lodge. We walked over to the igloo shaped construct. We were able to go inside. You could still smell the copal resin, a smell my husband and I were both familiar with and fond of. The smoke of copal, when heated by charcoal, transforms and smolders as the sacred smoke carries messages to the spirit world. The spirit of this plant and its medicine allows us to see life more clearly and inspires divine insights. The Mayan Indians hold copal as very sacred and have used it in ceremonies since before the invasion of the Spanish conquests to the Americas. The name for copal is pom in Mayan tongue, as we were told. Especially sacred is the resin that comes from a tree that has been struck by lighting or “Thunderbeings,” which holds the most beautiful spirit. The Mayan creation story, Popul Vah, it is described as a "seeing instrument." Copal resin is said to revel invisible energies that appear like rays of sunlight filtering through an early morning mist. Healers may use it as a diagnostic tool to help them see the deeper dimensions of a person’s energy field, which comes to the healer for help and healing. Gazing through the smoke is a way to detect illness and energy blocks. It may be used for clearing and clarifying the mind since it holds the influence of purification and protection. My husband and I use this same resin in our spiritual practices, but now we got to see where it was being used in this type of culture. We sat quietly inside, listening to our divine guidance. I felt so at peace knowing my husband was right by my side. We were getting an opportunity to experience our oneness, our place and part in this vast cosmos. We were explained that the lodge symbolizes the womb of Grandmother Earth and the heated stones represent her body, which supports all life. The fire that is used to heat the rocks represents the perpetual light of the world, and is the source of all life and power. The water slowly releases the heat in the stones, which rises as steam and permeates the air to create a hot, humid atmosphere conducive to manifestation of the particular intent of the ceremony. This experience was one I will take with me always. As I sat in quiet meditation, I knew that our horses carried us this place as it was supposed to be. I realized at that moment that a horse is the projection of peoples' dreams about themselves - strong, powerful, beautiful - and they have the capability of giving us escape from our own minds and give us a moment to see the world like they do. And for those three hours, my husband and I saw that vision that the horses gave us…outrunning a beautiful storm. The island only takes about 3.5 hours to circle, so for the week we decided to rent a jeep in order to get out and do all the things we wanted to do. We decided to go looking for the perfect beach to lay out and spend some quiet time together. We loaded up the jeep and headed off. As we circled the island, we saw virgin beaches and commercial beaches everywhere. We decided to go somewhere a little more private and where the waves were calm. We rounded a curve in the road, and at the same time, we both saw the perfect spot; it was secluded, a reef created a barrier to break the waves and the incoming water was calm and clear. We pulled off to the side of the road, as there was no parking, unloaded our stuff and our minds, and set for the sparkling white sanded beach. The water was warm and the sand felt great under our toes. We set up a little spot for ourselves, watched the clouds roll in and out, held hands and reminisced about how it all began. We knew we were right where we were supposed to be. As we talked, I looked into Ehren’s eyes and just knew that our love will always last. We watched the waves creep along the shore, getting in and out of the water. We found beautiful coral pieces that we would take back as souvenirs of this sacred private cove of ours. I could smell the salty, ocean scent. The breeze was best in this small inlet, the sun was powerful and warmed us to our souls. The clouds formed beautiful figures of Mayan Gods and warriors watching down on us. This was Mother Nature’s birthplace. Beauty was given its name here, and this is where happiness cannot be expressed. We chose this place so we could chant with the sea, seek nirvana in a world that can be so chaotic. We were seeking a peace of mind, and that was our goal on this expedition this day. We were trying to calm the tempest in our minds. We sat on a white lotus, the white sanded beach, gazing to the horizon, knowing we were in a garden of peace, together…experiencing it together. As we wandered our trail became blurred and indistinct as the water’s edge advanced and receded. It is here where we found our serenity. Blooming nature was all around, and we basked in the presence of it all. As the hours passed, the sun and the ocean gave us what we needed, and we packed up. As we were gathering our things, the setting sun painted the backside of a storm brewing in the ocean. 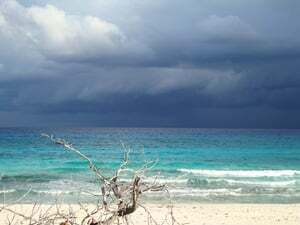 The mesmerizing scene took shape as the setting sun shined through moving curtains of falling rain under a storm on the East virgin beaches of Cozumel. A beautiful storm blew in this evening. First the wind brought the black and gray clouds, which layered over a pink and gold sunset. A growing thunderstorm cloud billowed upward, as we just ended our day at a secluded cove. The waves heaved like a tremulous bear, stirred from its slumber. The silent deep waters gave birth to white-capped rushes of waves, spraying into the air as they splashed against the Earth’s bare surface. The spray, like ghost-white wings, tossed to the stars on the backs of water-spirits. The winds welled up, from Earth’s deep core and broke onto the land with sullen roars. The mist veil gave way to lightning’s glare and the cloud drifts fell somberly to the horizon. Several lightning bolts struck beside the sun before the rain finally intensified and engulfed the scene across the ocean. A single thunderstorm cloud exploded skyward and rapidly intensified into beautiful chaos. The beautiful and ferocious voice descended into the distance, as we made our way to jeep to ensure we couldn’t be caught in her forceful breath. The waters leapt and the winds flounced by as we drove along side the storm, both of us smiling from ear to ear. Ehren struggled with the wind, to keep the jeep on the road. The gusts of streams of air were showing us that they could mold us to where they wanted us to be. The waves, once peacefully curled together, rose to roaring wave capped in white, became wildly chaotic. The ocean crashed against the rocks. Endless miles of isolated beach, once covered with gentle waves lapping, now show the force of the ocean behind it. Touching time and eternity, the waves broke like a rhythmic song. As we drove up the shoreline, the beautifully watery hues cascaded and smashed across the rocks lining the beaches. Rich hues of blue and green created saturated splashes and waves of color, beautifully capturing the stormy ocean scene. After making it back to town, the thick forest fog hovered over downtown Cozumel late at night, completely covering the island, as it decided to move to the main land. Across the ocean, the city lights of Playa De Carmen illuminated the fog from below as it flows down the valley like a river of clouds. A retreating storm at sunset left the peaceful fog and a partial rainbow over the mainland’s countryside. A site we both will soon never forget. After the storm, the island was left in a brief moment of purity, stripped all its airy tribulations, the air was fresh and sweet to the smell. I knew at that moment, at the break of the chaos, this was a symbol showing me that for even the worst of storms, our love grows strong and sure. This reminds me of his promise that I’ll be alone no more. Tulum, Mayan Ruins Our next adventure was one Ehren was most looking forward to, the ruins of Tulum. The Mayan Ruins of Tulum were a spectacular site to see. The setting of this majestically old site was on a beach that was a true place to declare Heaven. The shocking turquoise water and the bold black cliffs join to create an awe-inspiring picture. 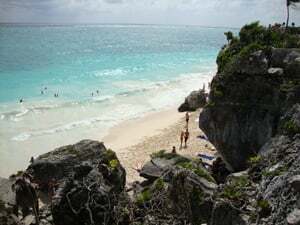 Tulum, perched atop cliffs overlooking the blue Caribbean, was inspiring to imagine the ancient Maya landing upon the pristine beach and creating an epicenter for culture and trade. We visited buildings that in its time were the city’s main center for ceremony and political activities. Iguanas, aka Mexican Chickens by the locals, basked lazily on the rocks in the sun. One of our favorite buildings in Tulum is the Temple of the Frescoes. As the name implies, there are frescoes with typical Mayan motifs in the interior. Some of the original colors are relatively well preserved. Outside this building there are some statues, also with traces of paint. Carvings cover this interesting little temple. One image you'll see on this building, and throughout Tulum, is the diving god. With his wings and his bird's tail, he's thought to be a symbol of Kukulkan, the feathered serpent god that played a big importance to many Mesoamerican cultures. He is also believed to be the symbol of the Venus morning star, which played an important role here at Tulum. Being the first city of the Mayan World to see the rising sun every day, Tulum is considered the Mayan “City of the Dawn.” (All info provided by my husband, the history buff, as he was in all his glory.) A truly amazing archeological build! Just thinking how these ruins withheld the hurricanes and winds of the ocean is mind blowing in and of itself! Through history, we learn of the hold, and from history’s mortar, our future is shaped. History sheds its past and adds to the new; the events change the times, and from this innovative evolutions of thought and consciousness occur. The history of the universe from the perspective of the Gods can be seen in the structures of the places like Tulum and you can see it is outlined in the Great Law. You can see your own personal history of this lifetime outlined as well and characteristics empirically placed in the constructs of this old site. Spoken words are history, but records of some remain a mystery. History was never my strong point, but it often reminds me of a repetition of events that dance to the rhythm of the same kind of achievements. Knowing this was once a great port, the serene radiance of this place taught be the subtlety of calmness and also how it can be turbulent as waves. We saw scientists in their white coats, standing at the top of a temple, still searching for answers. The recording of culture is history, but it also more than that. It’s the world of human action, and myths that we make of the fact. It informs a hidden agenda, unconscious of motive at times. We cannot recreate the script that was once written here, but thinking about the pages of history that once were, noble thoughts come to mind, about the people and their way of life. This ancient site is the history of now, a strange contradiction that makes sense when you gaze upon the technology used to create a place like this. You can see the great heroes of the Mayan time fall under a sculptor’s knife, inlayed in the structures of the monuments left. This chapter in history has not been forgotten and still stands to be a symbol of the extraordinary dream that was put into manifestation. The Fire Dance Our resort had an amphitheater where we witnessed a beautiful fire dance from spectacular performers. As we sat down, the night held a slight fog in the air, moist but perfect to show the moon above. The fire dance was beautiful. Flames entwined and music floated on the wind. Flames consumed the dancers’ bodies but were not destroyed, the used the confining cage of the flames to dance their emotions and tell their story. The sparks filled the night air with a whishing sound that was like no other. The dark figures in the middle of the blaze were strong and wielded their energy into the movements. The instruments they used glimmered and glowed, sometimes creating a greedy flame that would reach out, spitting incandescence. The illumination of the glow became a roar, as the flames were tossed here and there. The yielders of the flames, Spirits of Light and Warmth are what they emanated from their power, stood strong as the fire surrounded them in different shapes and forms. Their rhythmic movements pushed darkness to the periphery. The orange, yellow and white light dueled the darkness in all directions. It transformed from one form to another. The fire held a tight grip on my eyes. In blinding zeal, Ehren and I watched as the flames were tamed, tossed and flung through the air. You can almost see the passion of the fire spark and flicker in the air. The flames had a story to tell and they told that story all night. The language of the fire transcended words, but I knew what it was saying. The murmur of the blaze was low and ferocious, but the beauty was light and graceful. The performers played among the flames as we all watched them create their perfect dance. The inferno surged around them, swiveling by like a hurricane. Dark figures stood in between pillars of fire as the night air was singed. I was mesmerized by the allure and magnificence as the orange innocuous waves revealed a soft and silky glow. Feeling the raw energy of the dance was overwhelming, and was a sight that will never be lost in my memories of this place. Snorkeling Of course we couldn’t leave Cozumel without going snorkeling. We took a tour from a glass-bottom boat and entered the underwater world of Cozumel’s beautiful reef system. The abundant coral and plant life was amazing. There were schools of yellow and black-stripped fish everywhere, along with angelfish, rainbow-colored parrotfish and even small jelly fish! Yikes! We were even lucky to see a barracuda slowly cruise through a huge school of fish. We found out very quickly from the first reef we went to how great the visibility was and how fast the reefs drop off. Beneath the waters, greenish blue and cool, I felt like I was in a tranquil world separate from the noise above. There is a rapture of flight as we soared through the waters; the sundering waves wrapped our bodies in warmth as they carried us through their current. The mystic ocean is intoxicating because of the unknown mystery it holds. I find my mind wondering seeking for that dream my soul holds. Here the ocean is different from our experience with the storm; it was melancholy, showing me indirectly the various forms our emotions can take. The heart of the ocean remains pure and endless. As I floated from reef to reef, with Ehren at my side, I spilled my thoughts and then my soul to the ocean spirit. As I soared through the ocean’s beauty, trying to find my inner self, I could feel the healing effects of the waves push me this way and that, showing me that the path is not always straight, but if you keep in mind the goal at the end, you can never stray too far from the path. I have been learning a lot on this trip, the ocean was teaching me, the culture was teaching me and I knew these lessons would interlock with a life long education. You can find solace and an exceptional truth if you really listen to the sounds of the tides and currents. Upon this vast ocean, two souls were Ehren and I, over the waves and across the surface I have found a love so pure, only now listening to the songs of truth fill my being. The ocean took me to a place of peace. I felt the ocean’s soul and was mesmerized by the intricacy it holds and the mystery it still bares, much like me. There have been infinite battles that have been fought here, across stormy tines and calm waves, and life continues to flow around us. The fish carried my thoughts to the edge of the ocean, where I think life is like this underwater place. It is unexpecting and dangerous, lively and beautiful, filled with sorrow and joy, but continuing along on its cycle, as it always had. As I peered through my goggles, the clear water brushed my face. I looked up and thought, the ocean is the sky’s mirror, without form and void. The tide is the ocean’s heartbeat, the spray is the spirit, and I found myself smiling at how such a majestic being could create such a regal world for all those inhabitants below. Watching this world unfurl with grace, was humbling to know that in an instant it can change. Knowing that Ehren was by my side made it easier to embrace. Our beautiful Connection As we lay upon the golden and white sands of a secluded beach we found days prior on a trip around the island, I remember looking up and seeing my husband glistening in the ocean. These thoughts preceded my mind: It's both noble and eternal, so I discovered on this enchanting trip. Nobody understands love. It seems to be Universal. Timeless. Yet, it's also very individual, filtered by our own lives and expectations. I don't understand love, and can't understand love, because it's a different thing for each of us. However, when you have found it, it is nothing that can ever be described, captured or illustrated…just felt. In the rich forest's Moonlit midnight, His hands With loving, lingering Feather touch tenderly traced Tingling paths on succulent beaches Skin warm against velvet skin My lips soft against him In the crackling gentle glow Of the reflection of the ocean-light by the moon; Our love as pure as a drop Of mountain water on a leaf. Cherished are the memories that Brought us to this day, For yesterday, was just a dream A wish to reflect and ponder. A daydream where in my mind, A fleeting glimpse I'd see A vision of the true desires I longed for everlastingly. And when I dreamed, I did not know The love I'd feel today; The height of my true feelings, And the depths they would portray. And if I had a wish I could cast, A simple wish it would be Is that the love we feel this moment, Lasts eternally. Reality has merged now As you stand here by my side; And as I join your hand in mine, My heart does fill with delight. For as I pledge my love to you, I see in many ways, Reflections of my love for you Are mirrored in your gaze. And by our presence here today, And for the love we share, I thank you for our yesterdays That brought us to be here. But more than this, I vow to you, My wishes yet to come Tomorrow's dreams and fantasies, This day that we are one. Tomorrow's an adventure That we'll share together now; Our future's intertwined forever, Through our divine vow. I promise to remember In the future years and days, The love I feel for you this moment ... Dreams fulfilled today. That blessed are the days that I have looked into your eyes, And felt the warmth and love reflect, The essence of our lives. Accepting the other person's true nature involves lots of give and take; a high degree of predominance of love over lust; a willingness to dilute some of your rigid likes and dislikes that you were fiercely clutching; a fair degree of taming of egotism; a capacity to be receptive to criticism and a good sense of humor to laugh at our own idiosyncrasies. Above all it requires a firm commitment to the sanctity of marriage. In retrospect, we had a dream honeymoon and can’t wait to go on another romantic vacation together. This week was our first opportunity as a married couple to unite; therefore, creating the most blissful memories that will live on forever. Our wedding celebration had passed; our marriage will bring many struggles and happiness in order to build a happy life together and this honeymoon time acted as a nice breather to connect the two. Yesterday we dreamed of what might be; Today we validate our love; And tomorrow we will cherish the life we have shared as one.